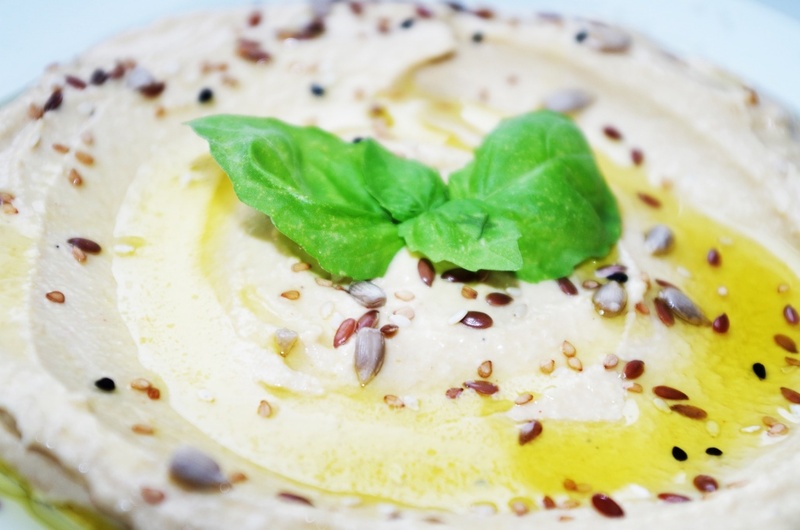 While traditional hummus, which is a dip made primarily of chickpeas, does not come in the vibrant green color, this twisted version of the traditional comes with a myriad of health benefits for your physical and mental health. Your initial response to spinach hummus might not be so great, but I assure you this recipe has won the hearts of many of my clients and friends alike. I vividly recall the first time I had some clients sample this during one of my group coaching classes several years ago. At first, all I’ve seen ahead of me were hesitant faces staring at the green dip in uncertainty. It only took a bite for them to change their minds, and in fact they came back for seconds. Whether you decide to use kale or spinach, they boost the hummus with antioxidants, Vitamin K, iron, and plenty of fiber. In addition, spinach and other greens are full of phytonutrients, and provide your body with innumerable minerals and vitamins. Best of all, if you follow the recipe precisely when pulsing the greens, your taste buds won’t really know there is kale or spinach inside. The key in this recipe is to pulse to spinach well with the water, lemon juice, and extra virgin olive oil. If you do decide to use kale in this recipe, it’ll definitely give it a more distinct taste than if you use spinach. If you’re a fan of kale, then this recipe is a great way for you and your kids to consume it. The main ingredient in this all-star recipe, chickpeas, are a significant source of plant protein, again aiding in the satiety you experience after consuming this dip. Chickpeas are a wonderful source of iron and dietary fiber, too. At this point you’re probably wondering if there’s any reason not to try this green colored dip. Whether you decide to use garlic or onions, they both work as a remarkable natural antibiotic, building your immunity and providing you with heart healthy benefits. They are great for digestion, and destroy harmful microorganisms in your gut. The fresh lemon juice paired with iron from the spinach allows your body to better absorb the iron. Pairing foods high in vitamin C, such as oranges, tomatoes, or lemons, with foods high in iron allows your body to better absorb the iron. The extra virgin olive oil provides plenty of healthy fat, and is incredible for your heart’s health, hair, skin and nails. Better yet, it is a food eaten by the Prophet (peace be upon him) and mentioned precisely in my book, Sunnah Superfoods. Unfortunately, today, there are many fake versions of olive oil, mixed with other oils and ingredients you really don’t want to put in your body. How do you distinguish real olive oil from their bogus counterparts? I discuss the essential tips to purchase authentic olive oil, how to use olive oil for your hair and skin, and more in my book. Furthermore, olive oil decreases the risk of heart disease, diabetes, and lowers cholesterol levels. Extra virgin olive oil provides you with satiety, and with the amount used in this recipe, undoubtedly keep you full and energized for several hours. This mouth-watering dip works great with vegetables or pita bread, or aside your grilled chicken at dinner. I must admit, you will find that it even tastes delicious right off the spoon. If possible, chill the hummus for an hour at the least prior to serving, for optimum taste. Drain the chickpeas from the water. Place the extra virgin olive oil, fresh lemon juice, water, spinach, spices, and onion in your food processor. Pulse until liquefied. Add the chickpeas and tahini paste. Pulse until it’s smooth and well incorporated. Transfer the hummus to a serving platter. Drizzle with olive oil and chopped parsley. Best if served chilled. Enjoy it as a dip for vegetables or with pita bread. Islamic Studies Chair at San Diego State U.